Recently, President Trump released a summary of his third budget, outlining the administration’s policy proposals, budgetary projections, and economic forecast for the next decade. 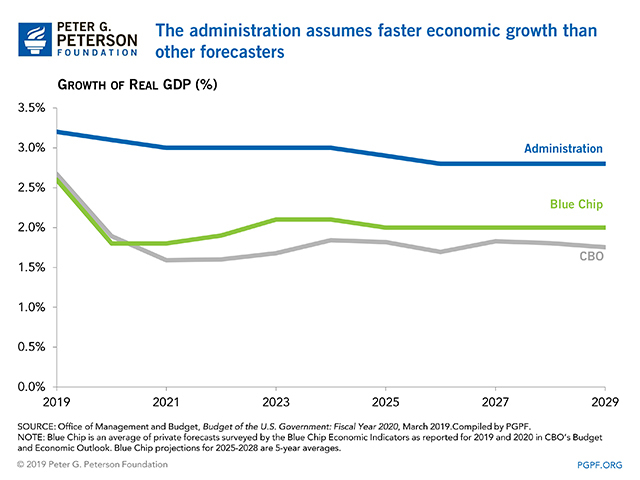 Although the budget would produce a decline in the deficit under the administration’s calculations, it relies on spending cuts that are unlikely to be enacted and optimistic projections of economic growth that significantly exceed those of most other economists. Revenues would increase from 16.1 percent of gross domestic product (GDP) in fiscal year 2019 to 18.1 percent in 2029. Spending would fall as a percentage of GDP — from 21.3 percent in 2019 to 18.7 percent in 2029. Debt relative to the size of the economy would be reduced marginally, from 79.5 percent of GDP at the end of 2019 to 71.3 percent at the end of 2029. The President’s budget would reduce the annual deficit from 5.1 percent of GDP in 2019 to 0.6 percent in 2029. However, much of that reduction relies on an assumption that real (inflation-adjusted) GDP will average 2.9 percent growth annually over the next 10 years. This level of projected growth is substantially higher than the forecasts by other organizations, including the Congressional Budget Office and the Blue Chip survey of private forecasters. Over the next 10 years, spending under the president’s budget would be $2.7 trillion less than under the administration’s baseline. 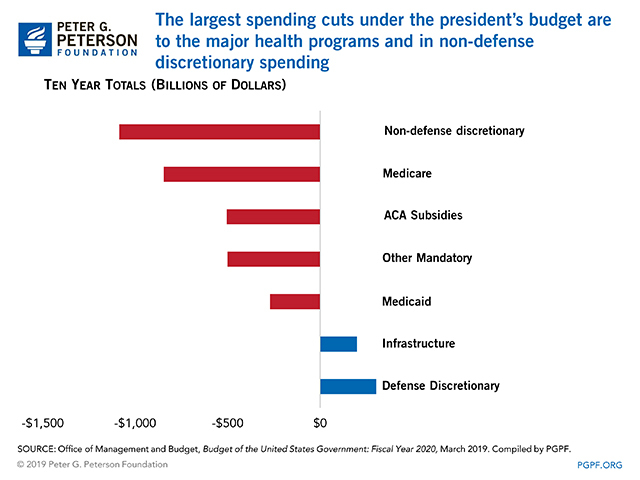 A large portion of the cuts would occur in programs classified as non-defense discretionary spending; the budget also proposes to reduce spending for a variety of health programs. Defense spending would be increased over the 10-year period. To avoid exceeding spending caps, the increase in defense spending over the next two years will be funded through an increase in war funding (known as “overseas contingency operations”). This is an accounting sleight-of-hand that circumvents the budget process and has been criticized by leaders in both parties. 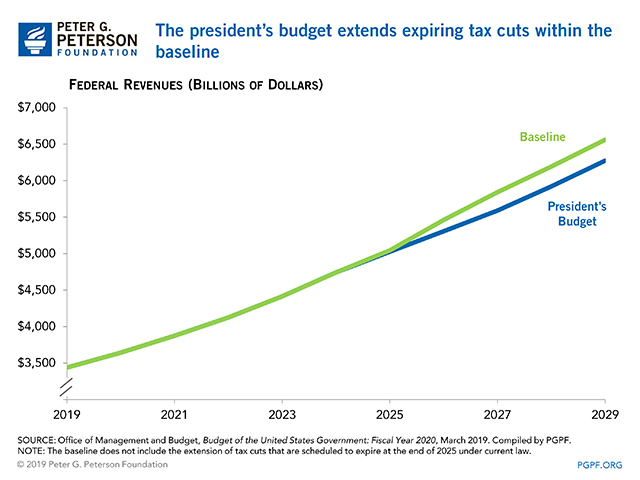 The only major revenue proposal — continuation of the individual income tax cuts as well as estate and gift tax provisions that expire in 2025 — is included in the administration’s baseline and not listed as a proposal in the budget. The estimated cost of extending these expiring policies is $985 billion over 10 years. 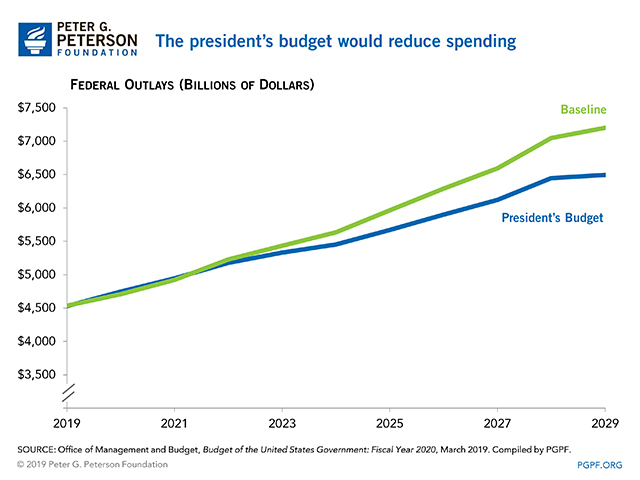 Other policies in the president’s budget would increase revenues by just $100 billion over the next 10 years. 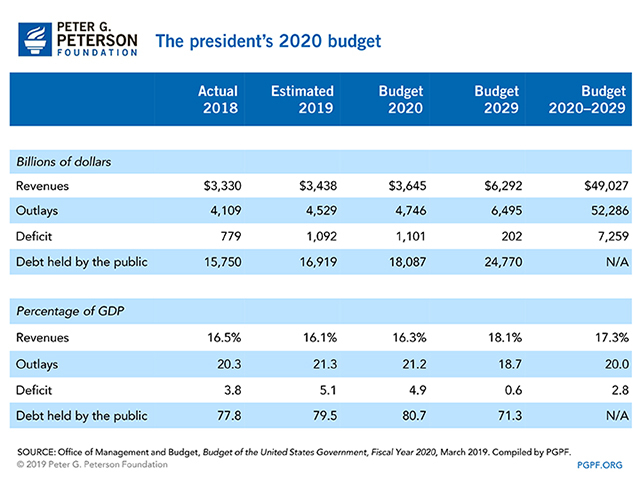 The president’s budget would reduce mandatory spending by a total of $1.9 trillion between 2020 and 2029 compared with the baseline. Medicare spending would be reduced by $846 billion and there are a number of other changes to healthcare spending, including reductions in some areas and increases in others. The budget also includes cutbacks affecting a wide range of programs for low- and middle-income families. Reforms to income support programs, including the Temporary Assistance for Needy Families and the Supplemental Nutrition Assistance Program account for a total of $327 billion in reductions between 2020 and 2029. 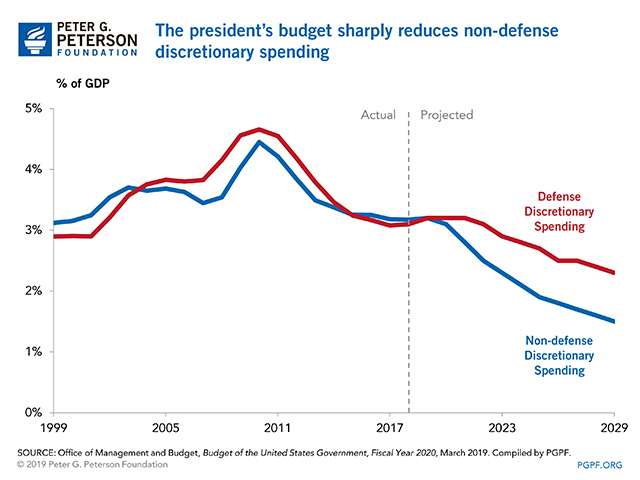 Under the president’s budget, non-defense discretionary spending would be reduced by $1.1 trillion over the next 10 years. While non-defense discretionary spending only makes up 15 percent of total spending, it funds a variety of government activities including investments in our future such as education, infrastructure, law enforcement, medical research, and grants to state and local governments. The proposed cuts would reduce non-defense discretionary spending to 8 percent of the budget in 2029. At that point, non-defense discretionary spending will total 1.5 percent of GDP — well below its 20-year historical average of 3.5 percent. As budget discussions begin in earnest, lawmakers should work to establish a framework that can help put the country on a firm fiscal foundation that will support economic growth and better prepare our nation for the future.